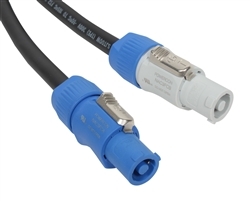 PowerCon® is a lockable 3 pole equipment (AC) connector with contacts for line, neutral, and premating safety grounds. It is rated at 20A/250V AC. Color coded for easy identification, PowerCon® offers power-in (blue) and power-out (grey) versions with different keying to avoid the possibility of intermating. The contacts are designed to prevent damage from arcing when disconnected while under load. This cable is professionally assembled in our Elite Core Audio shop and is used for powering a variety of sound and lighting equipment.